This is going to be yet another one of those posts where the company brought so much new stuff to Las Vegas, we wonder how they even got it all there in the first place. Thermaltake, in addition to all the Tt eSPORTS gear that they already lugged into their suite, also brought all their new products from their PC DIY lines including 10 PSUs, 4 notebook coolers, 10 new case fans, 5 storage devices and 13 PC chassis. That's a lot of new products. Lets get the expected things out of the way first. 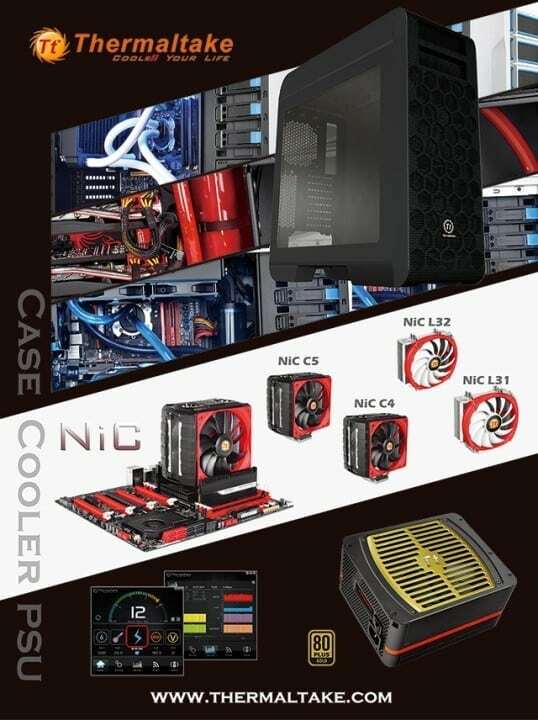 Thermaltake is showcasing new products in their Core Case Series, Commander G Case Series, Thoughpower PSU line, and all manner of PC cooling solutions. These are all bigger and better than previous version of these lines. But we are here for the cool new features and the latest and greatest from Thermaltake. First is the newest member of the Urban PC Chassis line in the Urban T81. This unit comes with all the nice new goodies line USB 3.0 ports, three pre-installed 200 mm fans, fully modular internal drive racks, and LCS & Advance Cable Management. If you were a fan of the sleek, elegant design of the Thermaltake Urban from last year, then this is the full tower for you at an MSRP of $189.99. This is how style looks when it takes practical out to dinner. Next up is the new flagship power supply unit for Thermaltake, the Toughpower DPS 1250W Platinum. This all digital PSU is not only a platinum 80+ rated unit, it is also comes with innovative software to fully control the unit. Taking it to the next level, the DPS software is also cloud complaint and helps track operational cost of your PC system. You can now use the automatically created database to find how and when you can lower your PC operational cost and share that with your friends. Or calculate whether you're making anything on BitCoin or LiteCoin or DogeCoin. Finally, Thermaltake uses a different approach to improving their cooling solution by focusing on the one thing they all have in common: Fans. The new Luna series is designed from the ground up to improve performance, lower noise, and keep the Tt style. 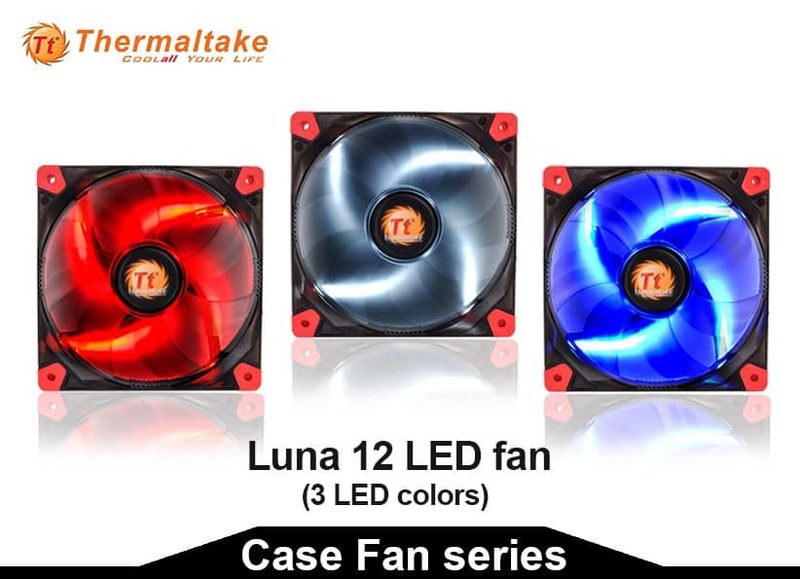 These fans will be offered stand alone for your case in a variety of sizes with LED light choices. You can also expect to see the Luna series on all the new Thermaltake CPU and liquid coolers. Sometimes better performance is a simple fix. 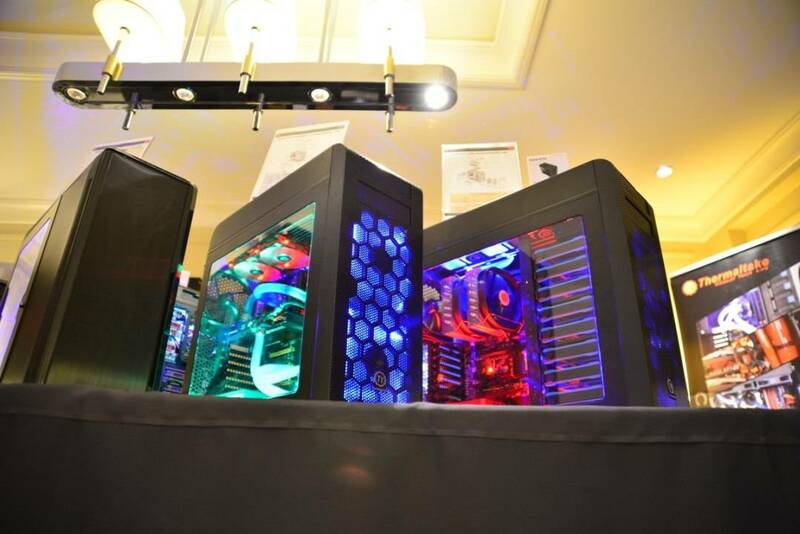 There are only about 40 more items Thermaltake has on display at CES 2014. But you can read more below and keep an eye on our coverage of CES 2014. Seriously if they had to fly to Las Vegas, then all this awesome gear had to have been shipped by a full-sized U-Haul cause all the shipping companies are still backed up from the holidays. January 6, 2014 – Thermaltake unveils a series of new innovations with high quality in 13 computer chassis, 10 power supply units, 4 notebook coolers, 10 case fans, and 5 storage devices. From stunning enclosure exteriors to ultra-high quality power and ventilation, Thermaltake products demonstrate that each and every element of PC DIY is worth assembling with the excellence it deserves. PC Chassis: New Urban Series, Core Series, and Commander G Series. .
PSU: Smart SE Gold 730W/630W/530W, Toughpower 750W, and Toughpower DPS 1250W Platinum. The highlight of Thermaltake cases are Urban and Core series, a continuation on Thermaltake’s tradition of innovative design and edgy technology in mid-tower and full-tower particularly for a liquid cooling system case. Based on its elegance and simplicity from Northern European designing concept, Thermaltake Urban Series consists of mid-tower and full-tower enclosures that epitomize silence, cooling and sophistication. This year, Thermaltake adds on new members which come equipped with features that will maximize your PC experience, from quiet computing panels, fan controllers, USB 3.0 SuperSpeed ports, to fully modular drive bays making the chassis more practical and functional as a complete LCS & Advance Cable Management Solution. Ideally able to maintain low temperatures in the system and keep minimum noise levels, and certainly a trendy decoration to enrich living quality as well. Apart from the perforated metal meshed panels, Core series is making its own path in another category by sharing the similar features as Urban whereas the noticeable differentiation is the delicate appearance. Additionally, Thermaltake Commander G Series will also be presented in valuable promoting demonstration, not just to gear up representative Thermaltake chassis with upgraded also maintaining its industrial-leading market trend. Continuously focus on the Non-Interference Theme and with the popularity of Micro-ATX and Mini-ITX motherboards, the slim tower side flow design efficiently optimizes cooling performance and allows the full compatibility with RAM of all kinds, and therefore users are free to fill their RAM slots with high-end overclocked RAM. NiC Series also comes with a tool-free design for fan removal and installation with ease, giving enthusiasts the excellence of performance, compatibility and silence. Water cooling is still one of the main significance of enthusiasts DIY users and Thermaltake will certainly fulfill their needs with the new DIY series. For all-in-one liquid cooling system, a general entry level version will be presented which has vast advanced upgrade capabilities on both styling and cooling. Thermaltake believes the fan is an essential part of PC cooling. The new Luna Fan series offers the perfect balance of silence, style and efficiency. From easy installation, long life sleeve bearings, enhanced airflow, to eye catching LED effects, the recent fan development is something users must not miss. 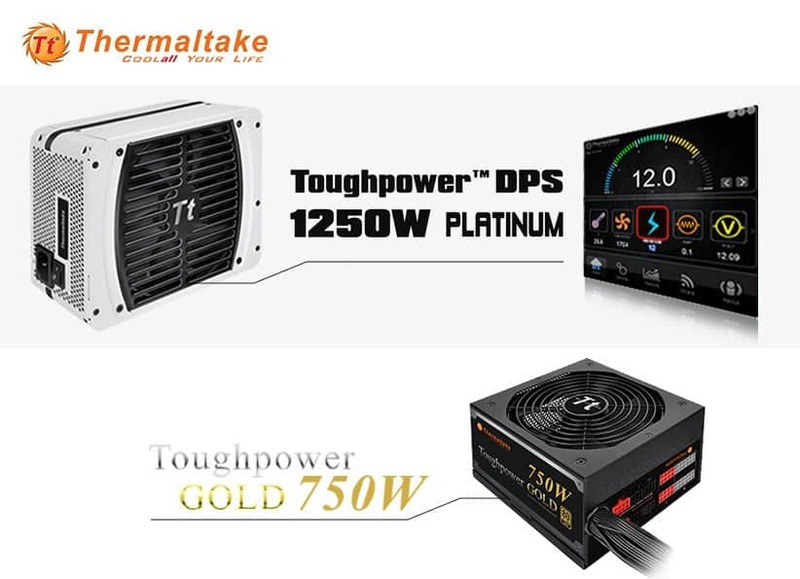 New revolutionary Thermaltake Toughpower DPS is an innovative fully digital- controlled power supply with DPS software. It offers a way to more accurately monitor and manage the power consumption and electricity cost for the PC, enabling an energy-saving solution for the environment. From monitoring the electricity cost of your PC to helping manage the operating expense; recording the status of the PC to help monitoring and organizing a quantitative database, to easy sharing in the cloud that enables user an impeccable function to share with friends. 80 PLUS Platinum certified, this extreme efficiency PSU series with 89-94% efficiency @ 20-100% load helps to cut down electric costs. Toughpower series, with the 80PLUS Gold power supply –Toughpower GOLD series saves energy through its high energy efficiency of up to 90% and is 80 PLUS® GOLD certified. With adoption of all flat cables not only eliminate cable clutter within the system, but takes up less space for better airflow. The 14cm cooling fan with intelligent RPM control guarantees cool performance and silent operation. Moreover, the modular cabling design allows use of cables users need resulting in improved optimal airflow and reduced system cutter. Be certain that you check this high performing PSU out! The latest presentation from Thermaltake in the essence of mainstream systems – the SMART SE Gold PSU, a performance series of power supply units (PSU) that incorporated various PSU high-tech components, leading technology and Eco-friendly credentials, ranged between 530W to 730W with semi-modular designs that will accommodate any mainstream build under any circumstance. All units are equipped with flat cables to give case builders the opportunity for better cable management , the built in industrial-grade protections for ac input 230v and 14cm cooling fan with intelligent RPM control guarantees cool performance and silent operation.